The shape of one’s nose can affect how someone perceives their own appearance and in some cases affects a person’s self confidence. At Nitai we provide non-surgical nose-reshaping treatments that can help you have a more desired nose shape. It is possible to correct the shape of nose that flat, has a ‘hook’ or sim-shaped due to an accident or injury. In the past, Rhinoplasty , an invasive surgical technique, was the only method to change the appearance of your nose. Rhinoplasty however, for many people is very expensive and sometimes people are not sure they want to commit to surgery. The non-surgical technique used commonly is injection of dermal fillers. We offer nose dermal fillers that can be injected in the suitable areas of your nose to help correct and improve many features you feel are unattractive. These procedures can often be performed in under an hour. Nose reshaping is performed by injecting dermal fillers to literally help reshape your nose into a more pleasing shape. You can have features such as a hook nose reshaped for a more uniform, less harsh appearance and can also help lessen the appearance of a nose that is bent to one side as well as to erase the appearance of harsh hollows. We can also use dermal fillers in the tip of your nose where skin may be drooping from age. The nose dermal fillers that are currently available on the market are “temporary” fillers. Permanent fillers can lead to fibrosis and nodules and are avoided by reputable doctors. The dermal fillers currently available differ in quality and length of time they last. 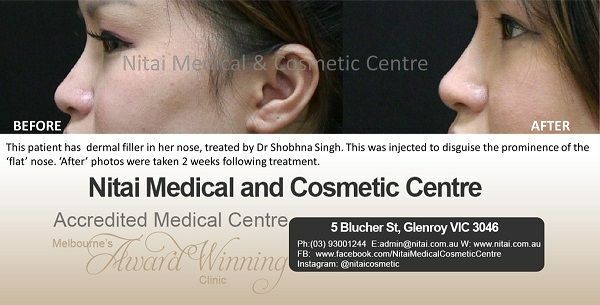 The longest lasting nose fillers last 9-12 months. At Nitai, we only use the long lasting fillers. The following patient was concerned her nose was too flat. However, the patient was only interested in seeing a subtle change. During the consultation with our Cosmetic Doctor, it was agreed that Dermal filler should be injected into the bridge of the nose to subtly enhance the nose. These nose treatments do require a lot patience and skill to achieve an aesthetically looking appearance. Following the procedure, the patient was satisfied with the subtle change to her appearance. This next young, female patient was concerned about the prominence of the ‘hook’ nose. 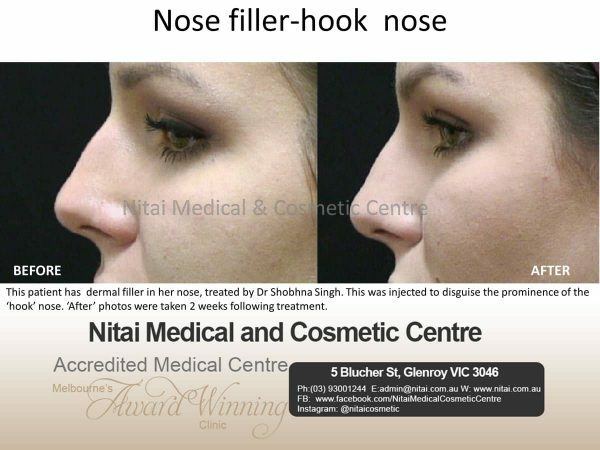 Dermal filler was injected either side of the ‘hook’ to disguise the bump and give a more even appearance. To find out more, take advantage of our free consultations with our cosmetic physician. Treatments such as nose reshaping are very specific and we will provide you with the personal attention you need for the custom reshaping you will require. We can give you examples of work we have done in the past so you can better envision your results. At Nitai our doctor has the knowledge and vision to provide you with the nose you believe will help enhance your looks. We will be certain you understand what can be achieved as well as any limitations to the nose reshaping procedure specific to your case. Call us today and discover the new look awaiting you.